Learn to play roulette for the fun and the thrill and you can't go wrong. So, without further ado, here are the rules of online roulette. Curious about how you can win more and lose less at roulette? 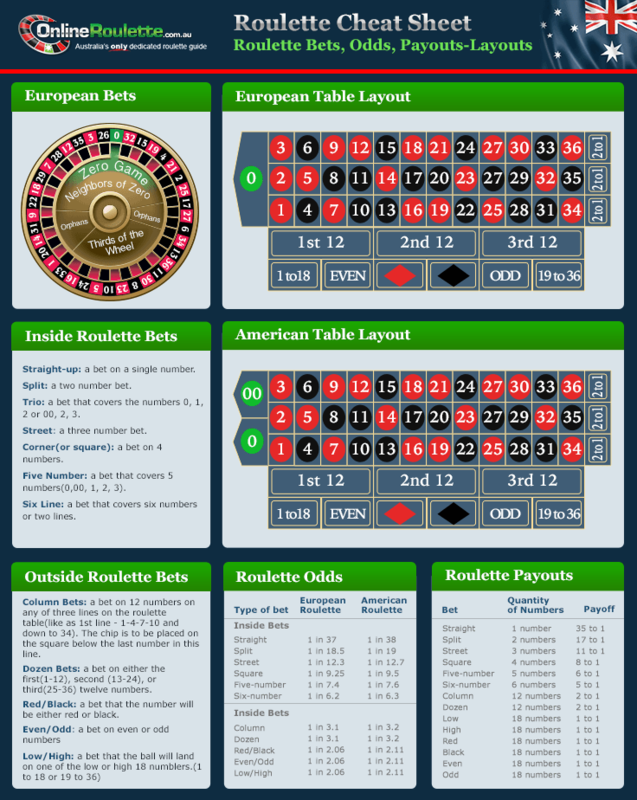 We have a guide to the many roulette systems out there, allowing you to experiment and see if they can work for you. Read our startegy guide and make sure you are clued up on the best way to play roulette, so you can shine on the felt. Don't miss our roulette odds chart. Click on the image for a larger version, download it, and keep it for reference. Learning how to play roulette online is really about mastering the different bets. But let's look at the setup first. The roulette wheel consists of a table where players can place their bet as well as a spinning wheel with either 37 or 38 pockets. The game centres on the wheel. Once all of the bets have been placed, the croupier (or dealer) will send a small metal ball spinning around the rim of this wheel. After a few times around the wheel, it will slow down and tumble randomly down into one of the pockets. Each of these pockets has a different number, and is red, black, or green. The type of pocket that ends up holding the ball determines which bets win and which bets lose. There are two types of roulette wagers: inside bets and outside bets. These are, simply enough, named for where they sit on the table. The outside bets are the even-money wagers. This means that the payout for a win is equal to the size of your bet. They include bets like high/low, even/odd, red/black, and others. They win nearly half of the time but the payouts are far from incredible. The inside bets, on the other hand, are the iconic wagers that cover one number (or up to a few). As such, they are less likely to win but each win comes with a higher payout. Luckily, both kinds of online roulette bets generally have the same house edge, so you can just go whichever you prefer. Strategy in roulette is often debated, but regardless, it goes way beyond the scope of this article. Suffice it to say that once you know how to play online roulette, you can go ahead and repeat the same simple steps as necessary. Lady luck may or may not be on your side in any given online roulette session, but that's just how things are in the casino. Even if you already know everything there is to know about how to play online roulette, it won't do you any good until you stop reading and start playing. In fact, if there's anything that still confuses you, getting a few spins under your belt is one of the best ways to gain a deeper understanding of the game. We have had our highly experienced, Australian staff members look through the top sites, particularly those that are straightforward enough for new players. Then, they reviewed these top options and posted them up here for you to see. These are the best sites on the Internet for Australian roulette players and each one of them will give you a chance to put your newfound knowledge to the test.